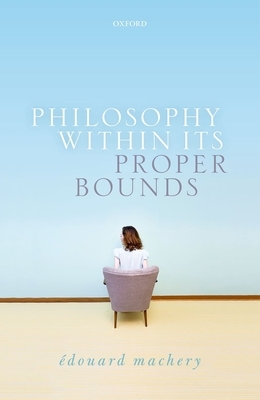 In Philosophy Within Its Proper Bounds, Edouard Machery argues that resolving many traditional and contemporary philosophical issues is beyond our epistemic reach and that philosophy should re-orient itself toward more humble, but ultimately more important intellectual endeavors. Any resolution to many of these contemporary issues would require an epistemic access to metaphysical possibilities and necessities, which, Machery argues, we do not have. In effect, then, Philosophy Within Its Proper Bounds defends a form of modal skepticism. The book assesses the main philosophical method for acquiring the modal knowledge that the resolution of modally immodest philosophical issues turns on: the method of cases, that is, the consideration of actual or hypothetical situations (which cases or thought experiments describe) in order to determine what facts hold in these situations. Canvassing the extensive work done by experimental philosophers over the last 15 years, Edouard Machery shows that the method of cases is unreliable and should be rejected. Importantly, the dismissal of modally immodest philosophical issues is no cause for despair - many important philosophical issues remain within our epistemic reach. In particular, reorienting the course of philosophy would free time and resources for bringing back to prominence a once-central intellectual endeavor: conceptual analysis. Edouard Machery, University of Pittsburgh Edouard Machery is Distinguished Professor in the Department of History and Philosophy of Science at the University of Pittsburgh, the Director of the Center for Philosophy of Science at the University of Pittsburgh, and a member of the Center for the Neural Basis of Cognition (University of Pittsburgh-Carnegie Mellon University). He has been the editor of the Naturalistic Philosophy section of Philosophy Compass since 2012 and was awarded the Chancellor's Distinguished Research Award by the University of Pittsburgh in 2011 and the Stanton Prize by the Society for Philosophy and Psychology in 2013. He is the Scots Philosophical Association Centenary Fellow at the University of Edinburgh (2016) and a Regular Visiting Distinguished Professorship at Eidyn (Edinburgh). He has also been recently elected on the Governing Board of the Philosophy of Science Association (2017-2020).